The Hoodie Store supply an incredible range of personalised hoodies, with lots of different styles and colours to choose from. We supply a range of hoodies for men, women and children, which can all be customised however you require. Buy yours online and we will deliver it throughout the UK. Your items can be personalised using print or embroidery, or just to buy plain and simple. Using leading brands for your items, including Fruit of the Loom, Gildan, AWDis and Uneek, you can always expect a high quality product. We use the very latest, state-of-the-art machinery to customise your clothing and our highly skilled team ensures quality control is carried out throughout the process. Buy your personalised hoodie online using our simple, easy to use, online personalising system, where we aim to make your hoodie as personal as you like. Our hoodies are a great combination of comfort and style and you can even create custom gifts for any occasions, for friends or for yourself. To order your personalised hoodie, simply select the product you would like and the size and colour you require then add your personalisation to the garment by choosing the position, text and image you wish to add. 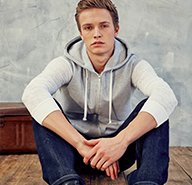 The Hoodie Store also creates customised, printed hoodies online for schools and universities, particularly leaver hoodies for school leavers. Customer service is essential to us, which is why we provide high quality products at cost-effective prices. 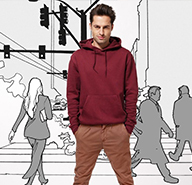 We provide one of the broadest ranges of promotional clothing in the UK. For more information on our personalised hoodies call 0844 800 0630 or email us on enquiries@thehoodiestore.co.uk.